Abstract: I saw many coolers for the up and coming Celeron line of processors from Intel. I came to think why don't they make an insanely large fan to fit in one of those 5 1/4" everyone seems to have to spare. As I click online through the wee hours one night about a year ago I saw many coolers for the up and coming Celeron line of processors from Intel. 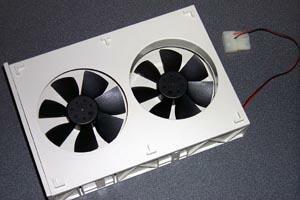 I came to think why don't they make an insanely large fan to fit in one of those 5 1/4" everyone seems to have to spare. Well I guess someone else was thinking of the same thing and here it is. First I would like to say thanks to the guys over at 3DCool for sending me this to put it to the test. Second of all I would like to describe the installation task or in this case the lack there of. Installation as you may well have guessed was a snap. All you basically have to do is mount the cooler in the open bay and secure it with the 4 small screws supplied. My problem was that I couldn't find the freakin' case mounting racks. Well the good thing is I just set it in the bottom slot and that was the end of that. Other than that so far everything was great so on to the test. Designed to terminate any heat inside your PC.